This is a delightful Christmas story for children and parents...a perfect holiday (or anytime!) book of how Little Star becomes the bright Christmas Star over the manger in Bethlehem. He tries to be the shiniest, happiest star, but he has to work really hard because when he cries, rust spots form on his points...so all night (stars have days when we have nights) he polishes and polishes. Angels and prophets, the Heavenly Chorus and many other stars will make anyone reading it smile. 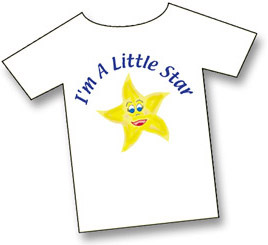 Illustrated by Heather Leigh Schaefer, children will delight in the many poses of the Little Star shining his points and getting ready for the Big Twinkle Contest. 36 pages plus cover, full color, perfect bound. Available from Bookman Publishing and Marketing LLC or directly from the author. Martha (Marty) Crikelair Wohlford is a professional writer who brings a wealth of knowledge and experience to her work. She has sailed all her life, is a licensed private pilot, diver, photographer, musician, and graphic artist. Marty lives in Fort Lauderdale, Florida but, as often as she can, goes "home" to Staniel Cay, Exumas, an island in the Bahamas where she nourishes her spirit. Email your name and address indicating you are paying by check or PayPal. 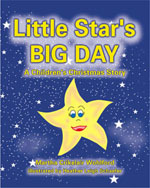 A wonderfully illustrated tale for young children "Little Star's Big Day" tells the story of how a hard working little star became the Christmas star. Although he is small and gives up easily he still always tries his best. This consistent attitude is what eventually causes him to shine above all the other stars. By being the best he could be he is surprised to find that he does win the competition and is selected to be the Christmas star. This is a great read for young children and young readers and a recommended purchase. Little Star hopes to win the big star contest set for December 25. When he discovers all the stars are as hopeful Little Star cries causing his points to rust. Little Star busies himself polishing, polishing, polishing and forgets all about checking to see what day it is. At last the heavens were astir, angels and prophets spent much time making notes and talking in hushed tones. Little Star has a special surprise waiting for him when he realizes what day it is. In Little Star's Big Day a children's Christmas Story Writer Wohlford offers a fanciful tale of a small star living way out in the far reaches of the universe. Little Star's determination to be the best he can be despite long odds against winning is a good lesson for children of all ages. Little Star faces up to the pitfalls facing him, carries on and ultimately achieves his goal. The tale of Little Star is one with which children can identify. Illustrator Schaefer's stars filling the pages of Little Star's Big Day a children's Christmas Story are sure to be child pleasing. All illustrations found in Little Star's Big Day a children's Christmas Story are ones children will enjoy. Little Star's Big Day a children's Christmas Story is a nicely presented work with shiny, heavy pages which are needed if the book is to be considered for classroom or other 'much child' use. I believe this is the first Bookman Publication book I have received for review and am pleased to find it is a good sturdy product. Vocabulary used in Little Star's Big Day a children's Christmas Story leads the book to being a 'read to' type work for younger children and all except the strongest readers in the 6-8 set. "Little Star's Big Day" is a children's book written by Martha Criklair Wohlford. I found this to be a very cute rendition of a Christmas story. As we all know, the star played an important part in the birth of Jesus, and this star senses that. There's a big contest among the stars to see who can shine the brightest. This story was written in such a beautiful and eloquent manner. Children will delight in the star and all he goes through to be the brightest. Heather Leigh Schaefer has proven to be an excellent illustrator and her artistic talent is astounding. The illustrations literally leap off the page with their liveliness. Children will be tickled by this book and parents will smile as they read along with their child. Of course, this story was written for Christmas but it would be wonderful for any time of the year. "Little Star's Big Day" serves as a perfect tool to teach children how to read and have a deeper appreciation for the stars. Furthermore, it's a unique way to teach children to accept themselves for who they are. Non-Fiction..a book to help anyone in recovery. This is a book written from the heart to touch the heart. The purpose is to give support and hope to women in recovery, to dispel the fear of treatment, and to show how to deal with feelings without drinking or using drugs in everyday life situations. Fiction..a novel that takes place in the Bahamas.